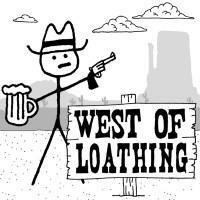 An Old West-themed comedic RPG with monochrome stick-figure art and surprisingly good music and sound effects. Pick your class (Cow Puncher, Beanslinger, or Snake Oiler), get a horse and a “pardner” (a combat teammate who is also tied to a major sidequest), and head out west to seek your fortune. Along the way, run into various random encounters and episodic sidequests featuring combat, puzzles, and a lot of humor. The game is warm and safe, with no game overs or permanent fail states and always warning you clearly before you do anything irrevocable, and whatever you do will probably be funny. Combat is, unfortunately, not very interesting. It’s old-school JRPG-style turn-based, but you simply don’t have enough party members or options to make this varied or tactically-deep enough to justify how slow it is. Fortunately, combat is rarely required. Most obstacles have multiple possible solutions depending on your stats and abilities - you can often sneak around or sweet-talk past possible fights. Avoiding combat will mean you level up less, but gear and buff-granting items make it feasible to power yourself up enough to get through required battles even if you’re underleveled. The game can allocate stats and skill points automatically when you level up, which is probably the best option for players who’d rather not research, especially as not all the systems are well-explained. The story is more of a series of disconnected scenes than a unified plot. While the individual experiences are well-done, nearly always funny, and occasionally quite suspenseful, they aren’t effective at building toward much of anything. The handful of arcs presented by the main quest and the most prominent few side quests tend to end in anticlimaxes. That’s okay as long as you’re looking for bite-sized experiences and not expecting an epic and cohesive tale. Correspondingly, the game works well for short play sessions (though I also enjoyed binging it for hours at a time) and is quite reapproachable if you put it down for a while. The game is designed to be played for as long or as short a time as you like - you can focus on the main quest or ignore it for side content, and once you do complete it you can watch the credits but the game makes it clear that this is only an ending if you want it to be. It’s also designed to be replayed, allowing you to skip the opening tutorial town after your first playthrough. This lets you try other class/pardner/horse combinations and experience some side content you didn’t see before - the way you find that content is semi-randomized, so while there will certainly be overlap between playthroughs you are unlikely to see all of it in any given playthrough and the order in which you encounter it can vary. And there are enough secrets that you can find significant new surprises even in sidequests you’ve already played. I Stopped Playing When: I finished the main quest and saw the credits, having also done a lot of the side content. While I do occasionally want to revisit the game’s world, the replayability hooks don’t really appeal to me. The combat is uninteresting enough that trying a different class/pardner combination doesn’t feel like it would add much, and while I’m sure there’s side content I missed, I did see a lot of it which I’d have to repeat, robbing the humor and surprise of most of its value. I had a great time with this game, but am unlikely to revisit it until enough time has passed that I’ve forgotten most of it.